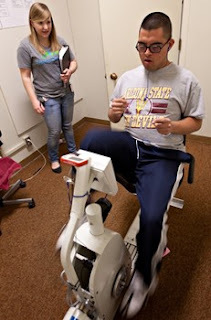 Researchers at the University of Arizona (ASU) are conducting research to determine whether assisted and intense exercise can improve the emotional, cognitive and motor functioning of adolescents with Down Syndrome (DS). The aunt of Marcus Santellan, a young man with DS, says that since he has participated in the exercise program, he is speaking in longer sentences and is more talkative in his home. Marcus is one of eight participants who are working out on a bike three times a week at ASU’s campuses in Tempe and Downtown Phoenix. Eight participants have already been studied by researchers. Down Syndrome is a chromosomal condition that affects approximately 400,000 children born in the U.S. DS children have physical characteristics and cognitive difficulties that limit their lifeskills. Only a few behavioral interventions have improved their ability to function. Shannon D.R. Ringenbach, an associate professor of kinesiology in the School of Nutrition and Health Promotion, intends to show that Assisted Cycle Therapy can potentially help improve the lives of people with DS. Two years ago, Ringenbach conducted a smaller pilot study that adolescents with DS improved their manual dexterity and increased the speed at which they processed information. Researchers did not achieve the same results after one voluntary exercise session because people with DS have less strength and tend to be sedentary. A specialized stationary bicycle with a motor was used so that participants could exercise at a faster rate. Approximately 15 ASU undergraduates and one doctoral student closely monitored the participants and encouraged them. Participants were tested intermittently for depression, and on their manual dexterity, ability to function, and cognitive skills.